Polish Pottery Spoon Rest. 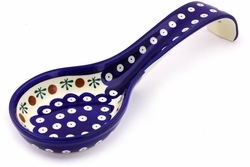 This oversized Polish Pottery Spoon Rest accommodates the largest ladles and mixing spoons. Hand made and hand painted, the piece adds a pretty touch of decor while keeping cooking utensils from messing up the stovetop. Use this stoneware spoon rest to keep range top or countertop clean and neat.